C.R.R. No. 3963 of 2013. D/d. 6.4.2016. For the Petitioner :- Abhijit Kr. Adhya, Advocate. For the Opposite Parties :- Dipankar Dandapath, Advocate. Sankar Acharyya, J. - This revisional application under Section 401 read with Section 482 of the Code of Criminal Procedure, 1973 (in short Cr.P.C.) has been directed challenging the judgment and order dated 30.08..2013 passed by learned Sessions Judge, Purulia in Criminal Appeal No. 22 of 2012 under Section 29 of the Protection of Women from Domestic Violence Act, 2005 (in short P.W.D.V. Act) setting aside an order dated 25.09.2012 passed by learned Judicial Magistrate, 3rd Court, Purulia in Miscellaneous Case No. 131 of 2012 under the provision of the P.W.D.V. Act. 2. Petitioner in this revisional application is a women and she has ventilated her grievance against a man who has been made opposite party no. 1. 3. Some admitted facts as transpire from the materials on record are that marriage was solemnised between petitioner and opposite patty no. 1 on 27.04.2008 and they lived together as married couple in the residence of opposite party no. 1 continuously for a long time and that out of their such living a son has born on 17.08.2010 at Purulia Sadar Hospital while the petitioner stayed in her father's house as she came there during her pregnancy. Thereafter, petitioner did not return to the house of opposite party no. 1. Petitioner and her child have been living in petitioner's father's house. On prayer of the opposite party no. 1 in a matrimonial suit being no. 27 of 2012/81 of 2011 learned Additional District Judge, 2nd Court, Bankura passed an ex parte decree on 23.04.2012 against the present petitioner declaring her marriage with the opposite party no. 1 is a nullity under Section 12 (1) of the Hindu Marriage Act, 1955 with effect from 23.04.2012. 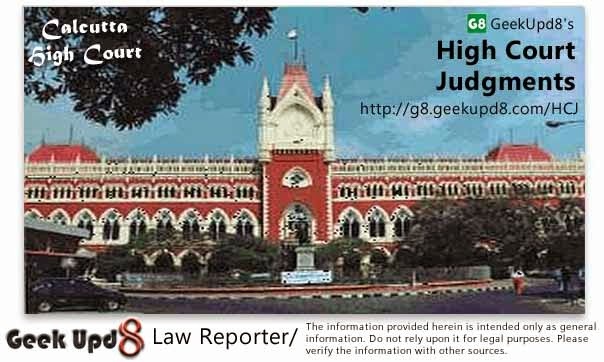 On 29.05.2012 petitioner filed Misc. Case No. 131 of 2012 against the opposite party no. 1 alleging domestic violence and seeking reliefs under the P.W.D.V. Act. Opposite party no. 1 appeared in that case on 4.09.2012. He challenged maintainability of petitioner's application under the P.W.D.V. Act in Misc. Case No. 131 of 2012. Hearing the point of maintainability learned Judicial Magistrate, 3rd Court, Purulia passed order dated 25.09.2012 rejecting the prayer of opposite party no. 1. Said order was challenged by opposite party no. 1 filing Criminal Appeal No. 22 of 2012. Said appeal was allowed in the impugned judgment dated 30.08.2013. It is also admitted fact that the opposite party no. 1 is a practicing advocate in Bankura Court. 4. Learned Sessions Judge, Purulia allowed the appeal with cost with observation that "when the marriage between the parties is not found to be subsisting when the proceeding was started under Section 12 of the P.W.D.V. Act, 2005, I think the said proceeding cannot be continued so long as the O.P No. 1 wife has not been able to get an order setting aside the decree of nullity of their marriage as passed by the learned Additional District Judge, 2nd Court, Bankura". Learned Sessions Judge passed order setting aside the order dated 25.09.2012 passed by learned Judicial Magistrate, 3rd Court, Purulia in Misc. Case No. 131 of 2012. 5. Moot question for determination in this revisional application is whether learned Sessions Judge rightly set aside the order dated 25.09.2012 of learned Judicial Magistrate. 6. At the very outset I like to note that it has been brought to my notice in this case that during pendency of the appeal in the Court of learned Sessions Judge, Purulia the learned Judicial Magistrate, 3rd Court, Purulia heard the Misc. Case No. 131 of 2012 and passed final order. However, said final order of learned Magistrate is not a matter under consideration in this revisional application. 7. At the time of hearing this revisional application learned counsel for the petitioner has cited a decision of the Hon'ble Supreme Court of India in the case of V.D. Bhanot v. Savita Bhanot reported in (2012) 3 SCC 183 and has argued that even if a wife, who had shared a household in the past, but was no longer doing so when the P.W.D.V. Act came into force, would still be entitled to the protection of a P.W.D.V. Act, 2005. Learned counsel for the opposite party no. 1 urged that learned Sessions Judge, Purulia has rightly followed the decision of the Hon'ble Apex Court in the case of Inderjit Singh Grewal v. State of Punjab and Another reported in (2011) 12 SCC 588 and learned Sessions Judge rightly observed that the proceeding under Section 12 of the P.W.D.V. Act cannot be continued so long as the O.P. No. 1/wife has not been able to get an order setting aside the decree of nullity of their marriage. 8. Having gone through the impugned judgment it appears that learned Sessions Judge referred to the judgment of the Hon'ble Apex Court in the case of Inderjit Singh Grewal v. State of Punjab and Another (Supra) and learned Sessions Judged made his finding in the last line of first paragraph at page- 3 (continued from page- 2) that it was further observed (as if by the Hon'ble Apex Court in the referred judgement) that unless the decree for divorce passed by the Civil Court is set aside, the complaint under Section 12 of the Act is not maintainable. On going through the said judgment of the Hon'ble Supreme Court I do not find any such clear verdict as mentioned in the impugned judgment. However, from the factual matrix this case under my consideration is distinguishable from the case of Inderjit Singh Grewal (Supra). On going through the decision of the Hon'ble Apex Court in the case of V.D. Bhanot v. Savita Bhanot (Supra) I am of the view that the legal position as discussed in paragraph 12 "We agree with the view expressed by the High Court that in looking into a complaint under Section 12 of the P.W.D. Act, 2005, the conduct of the parties even prior to the coming into force of the P.W.D. Act, could be taken into consideration while passing an order under Sections 18, 19 and 20 thereof. In our view, the Delhi High Court has also rightly held that even if a wife, who had shared a household in the past, but was no longer doing so when the Act came into force, would still be entitled to the protection of the P.W.D. Act, 2005" stands in support of petitioner's claim of maintainability of her case under the provisions of the P.W.D.V. Act. 9. In the instant case, the petitioner was not in a legal position to claim herself as wife of the opposite party no. 1 on the date of filing her case under the P.W.D.V. Act due to passing of the decree of nullity of her marriage with effect from 23.04.2012. According to the impugned judgment, after passing of the said decree the proceeding at the instance of petitioner for reliefs under the P.W.D.V. Act is not maintainable. 10. In my opinion, an application by an 'aggrieved person' or a Protection Officer is essential for maintaining a proceeding in view of the provisions of Section 12 of the P.W.D.V. Act. Here petitioner filed the application as 'aggrieved person'. Question is whether her right to claim herself as aggrieved person was ceased with effect from 23.04.2012. 'Aggrieved person' has been defined in Section 2 (a) of the P.W.D.V. Act as- "aggrieved person" means any woman who is, or has been, in a domestic relationship with the respondent and who alleges to have been subjected to any act of domestic violence by the respondent. In her application petitioner alleged that she had been subjected to physical as well as mental torture by her husband during her living with the O.P. No. 1 in a shared household as wife of the opposite party no. 1 which attracts the definition of "domestic violence" as per Section 3 of the Act. Undisputedly petitioner was wife of the opposite party no. 1 till the passing of the decree of nullity of marriage on 23.04.2012. In order to establish herself as aggrieved person any woman must prove first that she is or has been in a domestic relationship with the respondent. As per definition in Section 2 (f) "domestic relationship" means a relationship between two persons who live or have, at any point of time, lived together in a shared household, when they are related by consanguinity, marriage, or through a relationship in the nature of marriage, adoption or are family members living together as a joint family. According to factual matrix in this case the petitioner and opposite party no. 1 have lived together in a shared household till petitioner's departure from that house during her pregnancy stage as the petitioner and opposite party no. 1 were related each other by marriage. Significantly, it is mentioned that out of their such joint living a child has born. Therefore, as per definition of "domestic relationship" it can be said that even after passing the decree of nullity of marriage the domestic relationship between petitioner and the opposite party no. 1 for the purpose of P.W.D.V. Act subsists out of their past joint living as legally wedded couple. In this connection I like to note that petitioner's application cannot be treated as an application under Section 125 of the Cr.P.C. The P.W.D.V. Act is a special beneficial legislation to protect the rights of women expanding the limited scope of Section 125, Cr.P.C. Such wider scope is required to be kept in mind in course of dealing with any matter under the provisions of the P.W.D.V. Act but certainly within the ambit of the language used in the statute. Be it noted that in a judgment in the case of D. Velusamy v. D. Patchaiammal reported in (2010) 10 SCC 469 (cited by learned counsel for the petitioner) extended scope in the P.W.D.V. Act has been discussed. Said case, though not similar according to facts to this case, but it throws light to understand the legal position on the subject. 11. In the instant case, petitioner alleged physical and mental torture upon her by opposite party no. 1 during continuation of their marital relationship. She also alleged that opposite party no. 1 kept her 'Stridhana' property with him and she was not provided maintenance for herself and her child by the opposite party although the petitioner is unable to maintain herself and her child. Since her marital relation with opposite party no. 1 has been declared a nullity with effect from 23.04.2012, her right to claim maintenance from opposite party no. 1 may not be proper under Section 125 of the Cr.P.C. But she cannot be debarred from seeking reliefs against the opposite party no. 1 ventilating her grievances against opposite party no. 1 who is engaged in legal profession as an advocate. In my opinion, the P.W.D.V. Act is the proper enactment for her redress. In this regard the latin maxim, "Ubi jus ibi remedium" (wherever there is a right there is a remedy) may be mentioned. 12. In conclusion, I find and hold that learned Sessions Judge, Purulia has failed to consider the facts and circumstances properly and his finding against the maintainability of the petitioner's application under Section 12 of the P.W.D.V. Act is neither correct nor legal. As such, the impugned judgment is liable to be set aside. Accordingly, the judgment dated 30.08,2013 passed by learned Sessions Judge, Purulia in Criminal Appeal No. 22 of 2012 is hereby set aside. The order dated 25.09.2012 passed by learned Judicial Magistrate, 3rd Court, Purulia is left without interference. This revisional application is allowed. 13. Copy of this judgment be sent from department to learned District and Sessions Judge, Purulia with a request to communicate the same to learned Judicial Magistrate, 3rd Court, Purulia for information and necessary action. Urgent Photostat certified copy of this judgment if applied for be supplied promptly to the parties or their advocates on record observing usual formalities.